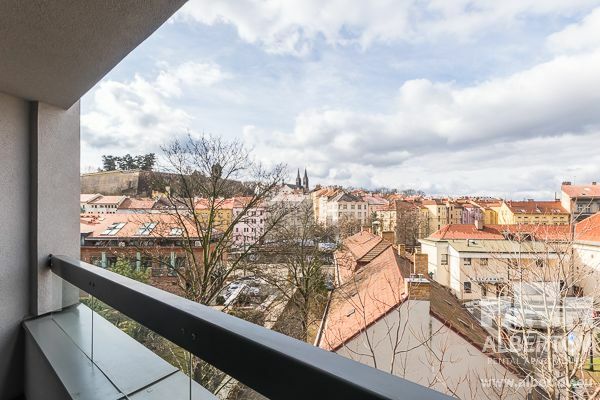 Completely furnished apartment – one bedroom apartment with a balcony for rent in Prague. Experience the feeling of home with the comfort of a hotel in this closed residential complex of Albertov Rental Apartments. 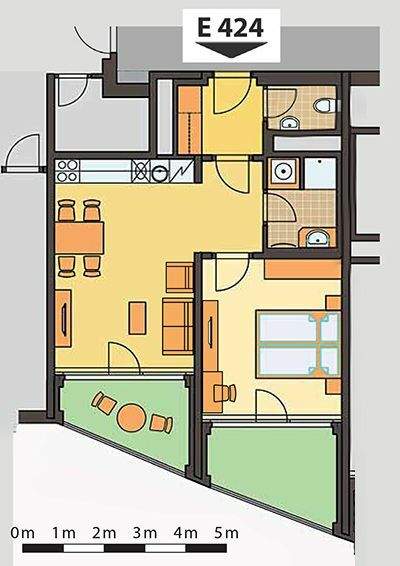 The relatively large apartment has several advantages: a separate toilet, a spacious living room with a fully equipped kitchenette, the possibility of entering two terraces, one from the bedroom and the other one from the living room. Large windows in the rooms aerate and illuminate the apartment. Practical darkening- blackout curtains are satisfactory. The interior of the apartment is furnished with designer furniture, a quality kitchen with modern appliances that will make your culinary work easier, a comfortable sofa set, and wooden floors in the living room with underfloor heating. For your pleasant sleep, the bed is equipped with high-quality anatomic mattresses suitable for allergy sufferers. Sufficient storage space will be provided by wardrobes in the bedroom, as well as built-in wardrobes in the hallway of the apartment. For entertainment, you can use satellite TV with many Czech and foreign programs, and fast Wi-Fi internet connection in the apartment, nowadays is commonplace. For your relaxation, the bathroom is equipped with pleasant floor heating, a practical shower, a toilet, a sink with LED lighting and the necessary washing machine with a tumble dryer. The 4th floor apartment with scenic views of the complex will surely fulfill the imagination of the most demanding vacationers for comfortable and convenient living. The residence is located in a quiet part of Prague under Vysehrad, not far from the center. Possibility of parking is under the premises of our residence, the elevator will comfortably take you to the floor of your apartment. Shopping options, a renowned restaurant on site and more. Cleaning of the apartment is optional and suggested. Comfort, convenience, and privacy, that is living in Albertov Rental Apartments.